I love to babywear and luckily for me my babies love to be worn (well carried but you know what I mean). It really helped me to develop a bond with baby boy when he was newborn and I carried him whenever I could. If he was ever unsettled I would just put him in one of our wraps and within a few minutes he would relax. When baby boy reached the age of about 20 months however he stopped wanting ‘ups’. I was gutted. Luckily though I was pregnant with baby girl and so I knew that I didn’t have long to wait until I had another little squish whom I could carry around to my hearts content. Now I’m not one for sticking to just one baby carrier. We have a large variety in our house. You never know which type of carrier will come in handy; ring sling for quick up and downs, structured carrier for longer trips, woven wrap for everyday. 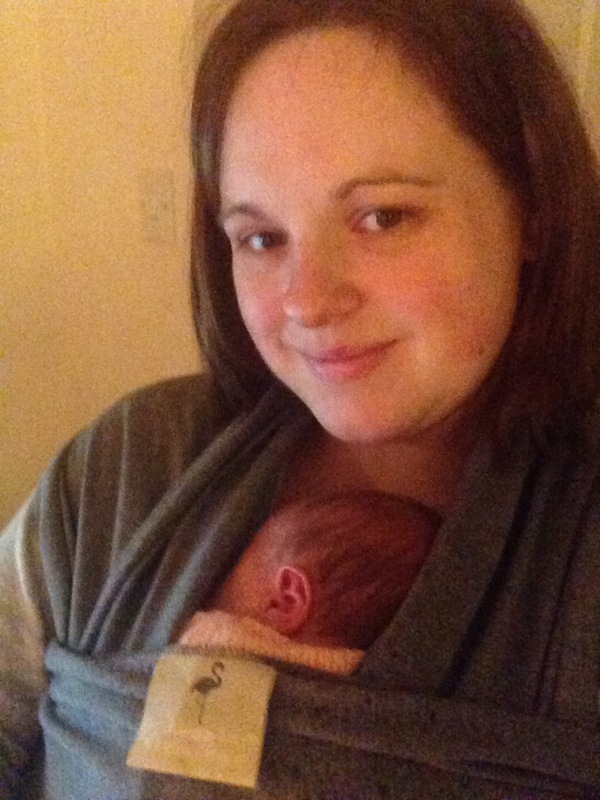 However, for the newborn stage and first few months the only carrier I like to use is a stretchy wrap. I had a moby wrap for baby boy which I was going to use again for baby girl but I happened to see a Facebook post from an American company who were moving into the UK market. Funki Flamingo were looking for people to try their stretchy wrap! I jumped at the chance. I couldn’t wait to try it out when it arrived but I still had a way to go before baby girl was due. A brand new stretchy wrap was sat there staring at me and I had no baby to wrap. Well what was a girl to do? Bribe the toddler of course! In a ‘very bad Mummy’ moment, I promised him chocolate in return for cuddles in the wrap. It worked and a few minutes later he was snuggled up to me, securely held in the funki flamingo. Now he is small for his age but he’s not exactly tiny so I was shocked at how supportive this wrap was. If he hadn’t wanted to get down after only 5 minutes I think that I could have carried him around for a good hour if not more in this stretchy. If it felt this good carrying a toddler then I was very excited to carry a newborn. It was a few weeks before I could put baby girl in the funki flamingo after she was born. A Caesarean section meant that I was too sore to carry her to begin with but once I felt able I went for a little walk with baby girl in the wrap. It was bliss! The fabric was smooth and soft and had just the right amount of stretch to it. Baby girl was instantly weightless and I could have carried her all day long. Some stretchy wraps are very wide but the funki flamingo is narrower than most. I see this as a good thing because it means that I didn’t have to fold it in half and therefore add an extra layer to the wrap. It made it much easier to keep baby girl at the correct temperature. Wrapping with the funki flamingo was and still is easy. The fabric glides over your shoulders and tightens really nicely. I have never had a problem with it sagging halfway through wearing and so unlike with some stretchies, I have never had to readjust it. The neutral colour means that Mr K is happy to wear it, although he still prefers a structured carrier as he hasn’t got the patience for wrapping. Despite this I would still love to see a range of colours. A bright pink one would suit me! When you are not using it it has its own little fabric, drawstring bag to keep it in. This saves room and keeps it from getting dirty. It is a little bit like wrestling a crocodile trying to get it in though. You have to roll the wrap very tightly. Baby girl is now 7 months old and I still carry her in the funki flamingo wrap. It is still extremely comfy and I can honestly say that I will probably still be able to use it when she is well over the age of 1. Have you tried the funki flamingo wrap? What are your thoughts? I was given this wrap in exchange for an honest review on Amazon. All thoughts and opinions are my own. Hi there, I’ve actually never heard of a funki flamingo carrier. So nice to hear that it’s stretchy yet supportive. And that you don’t have to fold it. Sounds like a good option as we’re entering summer.